It is at this point in our Lenten journey that the Church contemplates the instruction of St. John Climacus and his Ladder of Divine Ascent. Fr. 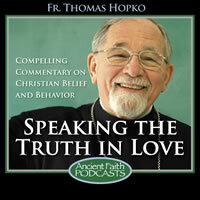 Tom takes us step by step through this treasure and makes it practical for us non-monastics! Fr. John shares from St. John Climacus and 1 John 2:15-17. Last week Fr. Gregory spoke of "Three Trees" and this week he considers "Three Ladders." In his sermon on the 4th Sunday of Great Lent, Fr. Gregory says there are two chief enemies of the spiritual life, self-righteousness, or vainglory, and despair. Fr. Ted reminds us that our journey toward God has already begun. On the fourth Sunday of Great Lent, the epistle reading to the Hebrews again is encouraging the faithful people to trust in the promises of God and to patiently endure, as Abraham did when God made the promise to him, that the promise did come, and that God’s promises are made—God swears by his own self when he makes these promises; he wants to show that he himself will keep his word, and therefore we are to trust this word of God and to patiently endure in this world and to have strong encouragements to seize the hope that is given to us by God in Christ and therefore to be able to enter with Jesus together into the presence of God and to have this hope of the salvation that comes through the patient endurance and the faith that is similar to Abraham. And on this Sunday as well, the gospel reading is taken from St. Mark’s Gospel, like the lenten gospels are, and it has to do with the disciples being unable to heal a boy who was possessed by demons and spirits and dumb spirits and dashed and thrown into fire and into water and unable to live, and when the disciples cannot heal this boy, Jesus is exasperated with them. He’s kind of annoyed, irritated. He says, “O [faithless] generation! How long am I to be with you? How long am I to bear you? Bring him to me.” And when they bring the boy, he is convulsing and falling on the ground and foaming at the mouth and rolling around. He’s absolutely driven mad, completely out of control. And then Jesus asks the father how long this has been, and he says, “Since his childhood.” And this power that’s in this boy, this destructive power, throws him into the fire and into the water to destroy him, and he begs Christ to help him, to have pity on him. And Jesus says to him, “All things are possible to him who believes.” So all things are possible. The man says, “I believe. Help my unbelief.” We identify with him when he says that: “I believe. Help my unbelief.” And then Jesus heals this dumb and deaf and convulsing child; he heals him, and he lifts him up, and he is given back to his father. And then the disciples ask why they were unable to do this healing, and Jesus says very specifically that this kind of healing can only take place by prayer and by fasting: praying and fasting. But we have to know also that it’s prayer and fasting together with faith. Faith: Do you believe. The man says, “I believe. Help my unbelief.” And God says, “To the one who believes, all things are possible.” All things are possible to him who believes, because with God, all things are possible. With God nothing will be impossible. Now on this Sunday, this fourth Sunday of Great Lent when we hear these readings, the Church also has us Orthodox Christians celebrating the memory of a very important saint of the Church, a man named John called “Climacus.” “Climacus” means a ladder, and he is called John of the Ladder. We don’t know what his actual family name was, but we know that this John, who lived in the sixth century, that he was the abbot of the Orthodox Christian monastery on Mount Sinai; he was the abbot of Sinai. And a fellow abbot named John, of a monastery of Raithu, also in the desert there, Egyptian desert, asked his friend John to give him a teaching, to write something for the monks and how the monks should live and generally speaking how Christians should live in order to be pleasing to God and to keep the commandments and to fight the spiritual warfare and to overcome the devil. And basically, we could say that John was asked by the other Abbot John to write about faith. How does a person of faith live? And about prayer and about fasting and about healing and casting out all these powers of destructive evil that can destroy us that are so powerfully shown in the gospel reading in this young boy who was convulsing and being thrown into fire and water. How do we come to ourselves? How are we actually healed? And this Abbot John, called John of the Ladder, wrote a writing, a book, that probably in Eastern Orthodox tradition, as been claimed, is the most wide-read book after the Bible itself; that it is a book that became kind of the book for those who live the ascetic monastic life. It was a book that was constantly read by Christians to be inspired and instructed about how to live as Christians, how to live as human beings. The book is technically called The Ladder of Divine Ascent and it exists in English translations and we can read it. It’s available to us. And this book, called the Ladder, perhaps the most wide-read book in Eastern Orthodox Church history after the Bible itself, is a book that every struggling Christian, everyone who wants to believe and to pray and to fast and to gain virtue and to defeat the devil and to appropriate the victory of God in Christ by the Holy Spirit in our human life, it is a wonderful book that anyone can read to their great, great profit and advantage. And it seems clear that that’s the reason why, during this lenten season, John is lifted up on this fourth Sunday of Great Lent and that the songs in church are about him and about his book and about his teaching about how we appropriate the salvation of God as fallen, sinful creatures. Now, in this book, which consists of 30 steps—there are 30 steps in this book, and each of the steps has its theme—John begins by saying in the book that God, the King, who is good and transcendentally and all-perfectly good, has created all human beings to share his divine life. And John begins by saying that some are his friends, others are his true servants, and some are worthless, and some are completely estranged from God and are actually God’s opponents, God’s enemies. And he says that the friends of God are those who surround God and the holy angels are in those friends of God; and the true servants of God are those who tireless and unremittingly struggle to do God’s will. The worthless ones are the ones who may even have been baptized but just reject God, forget God, and live by themselves. Those estranged from God can be the unbelievers or the heretics, those who actually destroy the word of God and twist them and do their own will. The word “heretic,” by the way, doesn’t mean a person who is mistaken; it means a person who chooses his own will. The word “heresy” doesn’t mean a mistake or an error; the word “heresy” means “choice,” and a heretic is a person who chooses his own way, chooses his own opinions, chooses his own mind, chooses his own interpretation of holy Scriptures and makes up his own faith over and against the faith of the saints delivered once and for all to the world by God through the great holy men of the old covenant—Moses and the prophets—and then ultimately and finally through his Son, Jesus Christ. And the enemies of God are those who consciously war against God and the truth of God and the love of God. So John writes the book so that we could learn how to be faithful servants, true servants of God, what that means, and how it’s done. Now, he begins by also saying, mentioning, that God is kind and good to all people, believers and unbelievers, Christians and non-Christians, faithful and unfaithful, just and unjust, pious and impious, passionate and impassionate, monastic and lay people, wise and simple, healthy and sick, young and old. He says that just as the light and the rain and the glories of God naturally are upon all people without distinction, so the love of God is poured upon all, and it’s basically up to us to receive it. It’s up to us to take it, to use it for good and not to spurn it, not to oppose it, not defile it. This is what he is teaching, and he says that belongs to all people, not just who are in the monastic life. Then he specifically speaks about married people. He wants to say in the beginning that, though he is writing for monks, there are people who are living in the world, and he says these people ask him, “What can we do? We have our families, we have our children, we have our duties. We cannot simply radically, totally go off into the desert and live on Mount Sinai in prayer and fasting.” And he says to these people, “I reply to them: Do all the good you can. Do not speak evil of anyone. Do not steal from anyone. Do not like to anyone. Do not be arrogant toward anyone. Do not hate anyone. Do not be absent from the divine services of the Church. Be compassionate to the needy. Do not scandalize or offend anyone. Do not wreck another man’s domestic happiness”—in other words, don’t commit adultery—“Be content with what your own wives”—and we might say today “husbands” and so on—give you. If you behave in this way,” the holy St. John says in the Ladder, you will not be far from the kingdom of heaven.” So we all, in the world and not: in monasteries, secular people, married people, celibate people, we are all called to believe in God and to keep God’s commandments and to pray and to fast and to fight the good fight and to be a brave and courageous warrior for the sake of serving God and keeping his commandments. Now John also says in the beginning of the book something very interesting. It’s all very interesting, but one point that we should notice: He says that when a person begins to come to faith, begins to hear about the Gospel, begins to hear about the Church, maybe even we could say nowadays goes to the church and hears the services and hears about the saints and looks at the holy icons and sees the beauty of it; he says that God the Lord catches them that way. He brings them in. He shows them all the marvelous things, so that they would be persevering, so that they would commit themselves. He says but then, only after he hooks them, so to speak, once God gets us into faith, gets us into the Gospel, gets us into the Church, then he shows us what it’s really all about. This Abbot John, St. John of the Ladder, he says God even somehow hides the reality of human life and the trials and the tribulations and the afflictions that one will have to go through in this fallen world when one really believes in God, but once he gets us hooked, then he lets us know. He said because if God would not get us hooked in the first place, no one would come to follow him. But once we are there, once we make our act of faith, once we try to follow him, then God shows to us the crosses that we have to bear, the insults that we have to endure, the reviling that we will have to go through, the persecution that will come from the opponents and the enemies of God, and that does come. That does come. And even, John says in the very beginning of the book, in the second step, he says that we are purified as believers by dishonors, sneers, derision, insults, by cutting off of our will, by patience in annoyances, by unmurmuring endurance of scorn, disregard of insults, and the habit when wronged of bearing it sturdily, when slandered of not being indignant, when humiliated not being angry, when condemned being humble, when being sinned against forgiving. He said blessed are those who follow this way, for theirs is the kingdom of God, because of course these are the commandments of Christ: Bless those who curse you. Pray for those who persecute you. They strike you on the one cheek; give the other. And as the Apostle Paul says, we are constantly degraded, humiliated, rejected, persecuted, but we are not depressed, we are not despondent, we are not overcome. John in this book tells us, tries to teach us, how we do that, how that works. You can go through this book step by step. And he says the first step is: We renounce the world, the flesh, and the devil. We give ourselves completely over to God. That’s how it all begins, and God will make it nice in the beginning, but then—then we’re going to see what it is we’ve gotten ourselves into by giving ourselves together with Christ to God. The second step is about detachment, that we have to be free, not to be bound by all these things that can hold us. You can’t serve God and mammon. You can’t be like Lot’s wife. You can’t turn back. Then the third step is about xeniteia, it’s called in Greek: exile, pilgrimage, that we understand ourselves in this world as pilgrims and exiles, sojourners in a foreign land, that we are not in the house of the Father; we are not [in the] presence of God. We are in a world that has been fallen. We find ourselves outside paradise, exiled from God, and that we have to realize and make ourselves exiles from this world and flee from the Egypts and the Babylons of this world without looking back, the Sodoms and Gomorrahs, to give ourselves to God. He says that at this point the devil will tempt us. He will want to make us turn back, like the people when they came out of Egypt. They said, “Oh! Why did we come out here? We’re just going to die here! We at least ate and drank back there. We’re crazy for following Moses and God.” We Christians could say, “We’re crazy for following Jesus. Why would we do this?” And St. John says we even have dreams of a kind of a sinful, sensual, carnal life, what we call in America nowadays “the good life,” rather than being some kind of crazy person who’s following a crucified Jew, believing that he’s the Son of God raised and glorified. So he says the temptations will be great for us once we begin to turn back, to go away. Then he says in the next step that that’s where obedience comes in, and certainly for the monk and for every Christian, to be totally obedience to God, to trust God, to be obedient to the Church, to be obedient to our elders, to be obedient to Scripture, to be obedient to the writings of the saints. And St. John says: Any person who does not emulate and imitate not only the Lord Jesus Christ but the holy people, the saints, is just a foolish person. We’ve got to learn from the holy people. He said however if anyone thinks that they could imitate a saint or some other person in the details of their life, then that person is insane and needs help. Yes, we follow generally the examples of the saints, but we do not imitate them in their details of their life; we do not want to mimic them. We follow them, but we use them as examples. Then he gives examples of the humility and the obedience of some of the monks that he met. This is very radical. It’s very radical how he describes it. It can even somehow put us off. We can say, “Oh, come on. This is just too much, John. St. John, you’re writing too much.” Especially when he gets into a description of a place that he called the prison, where all these monks are weeping and wailing and beating themselves and enduring insults and all this kind of stuff. Sometimes people just don’t even like that part of the book; they don’t want to read about it in the famous step four that is so radical. However, I believe that some commentators are right when they say what you really have there is kind of like a sixth-century 28-day program. Anyone who’s been drug-addicted or addicted by alcohol or food or so on and are trying to come off it, they have to sometimes be locked up, and they have to go through cold turkey, and they have to get all that evil power, alien poison, out of their system, and they can feel like they’re going crazy, and they can scream and beat themselves and so on when they’re trying to get these evil powers out of their body, out of their brain, out of their mind, out of their heart. I think that we know about those kind of programs that exist in our very world today, except nowadays you have to have insurance policies to pay for them, and you have to go to some kind of institutes and be under counseling and care. Well, in the sixth century you went to the monastery, you were put under the elder, and they locked you up and you dealt with your demons, and you got through them and you reached repentance by somehow going through that experience. In fact, one commentator, the man who wrote an introduction to the Ladder published by Paulist Press, he even made a comparison between this prison in this monastery and being in a prison camp. And he mentioned how so many people who were in prison camps—and we know some of them: Alexander Solzhenitsyn, for example, or Fr. Roman Braga, the abbot out in Rives Junction Monastery for nuns in Michigan, or Fr. Dumitru Stăniloae—how they spent years in prison under Communists, in solitary confinement, with nothing to do, and then all their memories, all their evils, everything went through them, their experience of life. And then, as Fr. Roman Braga would say, “You either surrender to the devils and are destroyed or you become holy. You come to know God.” But you’ve got to go through that purgation. No one can be illumined and no one can be deified and glorified unless they are first purged and cleansed, and that’s what John tells us in these first chapters of the Ladder—step three, step four, step five—about obedience and submission and purgation, how that has to happen, how the demons have to be expelled through the prayer and the fasting and the prayer of the elders and so on. And then he mentions step six, the remembrance of death, how it is the remembrance of death that makes us attentive and perceptive. Hesychius of Jerusalem said that before St. John, that if you want to be really perceptive and awake and aware and alive, you remember God in simple prayer and you remember death, and you keep your mind on the fact that you will die. And if we’ve lived every day as those who knew that they were going to die, according to the holy Fathers, then we would live in fidelity and love and obedience and mercy to one another, and not being gloomy, not being morose. Then he gets into step seven, a very famous step in the Ladder. It’s called “joy-making mourning—harapion penthos” in Greek, which means that there’s a joyfulness mixed with godly grief—not ungodly grief where we just weep for not getting what we want in this fallen world, but grieving over our sin, grieving over the sin of the world, grieving over how miserable we are, but doing so in the light of the mercy and the glory and the salvation of God. So he says for a real human being, a real Christian, mourning by which we are comforted is always mixed together with joy. It’s like, he says, honey in the honeycomb, that its joy goes together. He says the people who have grace-filled mourning are also filled with the spiritual laughter, the spiritual joyfulness of the soul. But mourning is necessary. Godly grief is necessary. And one of the most powerful sentences is in number 70 of step seven, where he says, “When our soul, our life, leaves this world, we shall not be blamed for not having worked miracles. We shall not be blamed for not having been theologians. We shall not be blamed for not having been wrapped up in divine visions.” He says, “But we shall certainly have to give an account to God of why we have not unceasingly, ceaselessly mourned.” So godly grief, 1 Corinthians 7, godly grief is necessary. Then the book continues, about freedom from anger and about meekness, and how anger is equal to murder and how anger cannot work the righteousness of God; how there is a righteous anger to hate the demons with, but never to hate the brother with. Then he speaks about remembering wrongs, harboring wrongs in our heart and nurturing them, and that has to be purged out. Then he speaks about slander and calumny, where we speak about other people and gossip and defile others with our words and look at other people’s faults and defects and that this is not befitting a person who is a believer in Christ and in God. Then in 11 he speaks about talkativeness, speaking too much, and then he praises hesychia, silence, stillness, that we must learn to be quiet inside as well as outside. Then he speaks about lying and deceiving and showing that it’s the worst sin of all, that it’s the devil [who] is the liar from the beginning. Christian people, real human beings, live in truth; they don’t live in fantasy. They don’t make up reality. Then he speaks about despondency, or spiritual gloom or indolence or indifference or spiritual sloth. It’s a Greek term: akedia. St. Anthony the Great was struck by it, he writes in his saying, because it’s the special demonic attack against people who try to be spiritual, who try to be godly, who try to live according to the commandments, and you get to the point where you say, “What’s the use? It doesn’t work any way.” Then we start using it as excuses to talk and to have hospitality and to walk around and to take a nap. But he says that this is the gravest of the eight capital vices. St. Isaac of Syria will call it a taste of Gehenna, hell itself; he said but that’s the real test of a person, when they stand over and against that spirit of lethargy and sloth and say their prayer and do their work and try, day by day, to be obedient to God. He says it usually strikes in kind of the middle of a person’s spiritual development. Then he speaks about the stomach and gluttony and how the spiritual life begins with our stomach and our bodies, and we have to learn how to control and master our stomach. Then you get to the longest step in the book, 15, about porneia, sexual lust, unchastity. He says that is always coming from gluttony. You pamper the body, you pamper the flesh, you fill the stomach with bad foods, too much food and drink, and you end up lecherous, lewd, and lustful, he says. But then about porneia and about lust he says: Never dialogue with it. It’s got all the answers on its side. Like Moses the Black was told in the desert: Just run from it, flee from it, don’t engage it. If you engage it, it will destroy you. So he says the purity that we seek is a warfare against nature itself in its fallen form, but with God it is possible to be victorious over this horrendous demon that attacks a person, and it’s in this step that is very detailed and very long; it’s 90 sentences he has in this step. Then he goes on about avarice, possessiveness, love of the money as idolatry in 16 and 17. Then he speaks about hardness of heart and insensibility, not being merciful, being stony, raging, stupid, hard, defending our own selves, saying we’re wrong but then we’re not wrong and then coming back and justifying. Then he speaks about prayer and psalmody and vigil and keeping awake and not surrendering to too much sleep. Then he speaks about courage and overcoming cowardice and fear. Then he speaks about the many forms of vanity and vainglory and sinful type of self-esteem—not the proper self-esteem that we ought to have as human beings made in God’s image, loved by Christ and saved by Christ, but where we just live for vanity. And he says spiritual people are especially attacked by vainglory and pride, because we pride ourselves on our fasting, we pride ourselves in our faith, we pride ourselves like the Pharisees in keeping all the rules, we pride ourselves perhaps in being monks or nuns or something like that. And he says that this vanity is connected with pride and then it leads to blasphemy and then we become really, really dangerous people. And St. Ignatius Brianchaninov and his modern book of the 19th century, The Arena, he points out that gluttony and porneia and possessiveness, those are the low-class demons, so to speak; they hit the carnal people—but the spiritual people are hit by vanity and pride, and they become the schismatics, they become the heretics, they become the people that harm the Church. Then he goes on to speak about meekness and simplicity, that we learn from Christ. He says meekness and humility are indefinable. You can only learn them by looking at Jesus. He called humility the thrice-holy virtue that no one can define, because Jesus said, “Learn from me, for I am meek and lowly of heart, and you will find rest for your soul.” Humility is the nameless grace, he says, named only to those who have learned it by experience. You don’t learn it even from angels or from books or from men, he says; you learn it only from Christ who said, “I am meek and humble in heart.” So he speaks about humility as virtually the height of human perfection. He speaks long about it, 69 verses on the beauty of humility, which is the perfection that then leads to diakresis, to discernment, to being wise, to having insight, because the Lord teaches the humble his way. He adorns the humble with victory; he adorns the humble with beauty. Then St. John in the book goes through again all of the virtues and all of the passions and all of the demons, showing us as best he can what the real perfection of meekness, humility, and discernment is really all about, and that step is very long, and it goes on and on. It’s twice as long as the one about porneia. It has 189 teachings about humility, meekness, and discernment. And then he summarizes it again the 26th chapter. And then as we get to the end of the book, he speaks about holy stillness, hesychia, a life beyond thinking, beyond figuring things out, a life in communion with God. And then the Ladder ends, and you can see, as it’s often pointed out, that it’s called the Ladder of Divine Ascent, but really what we are doing is descending, so that God would raise us up. As someone said, the Ladder of Ascent is an ascent downward into humility. St. Silouan said that, Fr. Sophrony said that, Fr. Zacharias says that when he teaches us about St. Silouan and Elder Sophrony. And then the 28th step is about prayer, the mother of all the virtues, and it has instruction about how to pray and what prayer is and what psalm-singing is. And then it ends up with dispassion, complete dispassion, apatheia, the fire of dispassion, which is not insensibility or hardness but total freedom, total freedom in God. And then of course it ends with love. For God is love, and ultimately it is all about love. So this is the book of St. John the Abbot of Sinai, perhaps the most-read book, the most studied book, the most followed book in Eastern Orthodox tradition after the holy Scripture, after the Bible itself. Written for monks, but fruitful and helpful for everyone who wants to deny himself, take up his cross, follow Christ, be a believer. It’s for the person who says, “I believe. Help my unbelief!” And it’s for the one who knows that only by prayer, only by fasting, only by doing the things that the Lord commands us to do, with faith, can we actually receive the grace of God, live by the grace of God, and be saved by the grace of God that is fully and completely poured out upon us in his crucified and glorified Son. Holy Father John of the Ladder, pray to God for us sinners. We believe. Help our unbelief. Grant us the grace of fighting the good fight, keeping the course, ascending the ladder which is a descent together with the humiliated Christ in order to be raised and exalted with him and glorified and deified by him in the unending kingdom which is to come.